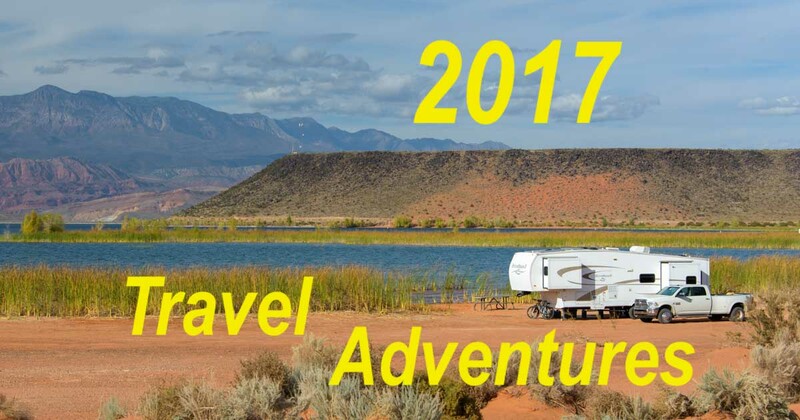 2017 was filled with incredible travel adventures for us, from exploring the backroads of eastern Wyoming and the Black Hills of South Dakota in our RV to flying overseas to Southeast Asia and Hawaii. Here’s a quick look back with links to every travel story we published on this blog in 2017! 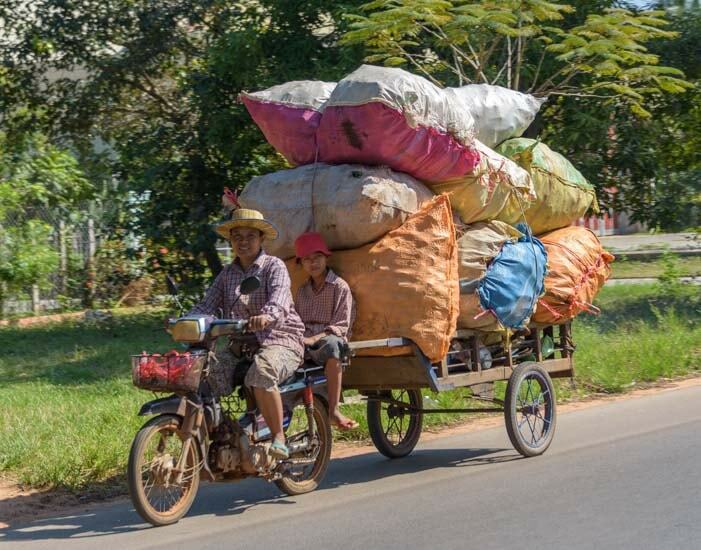 Before the year had even gotten out of the starting gate, we put our trailer in storage in Arizona and flew to Bangkok, Thailand, for a month of extraordinary and eye opening experiences (all our SE Asia adventures can be found here). 2017 began with us putting the RV in storage and flying to Thailand and Cambodia for a month! We had never been to Southeast Asia before — what an adventure! Not only was the architecture dramatically different than anything we’d seen before, the language itself was new to our ears and eyes. It was utterly exotic, and beautiful (and incomprehensible) in written form. 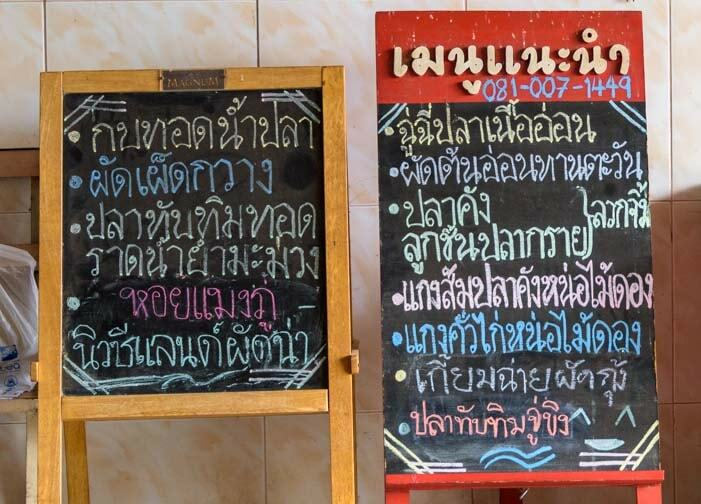 The Thai language not only sounded exotic, it looked exotic too! We found it nearly impossible to know what to order on a menu, but when we took a boat ride through a floating market, most of the fruits and vegetables were familiar even though the method of selling them was like nothing we’d seen before! 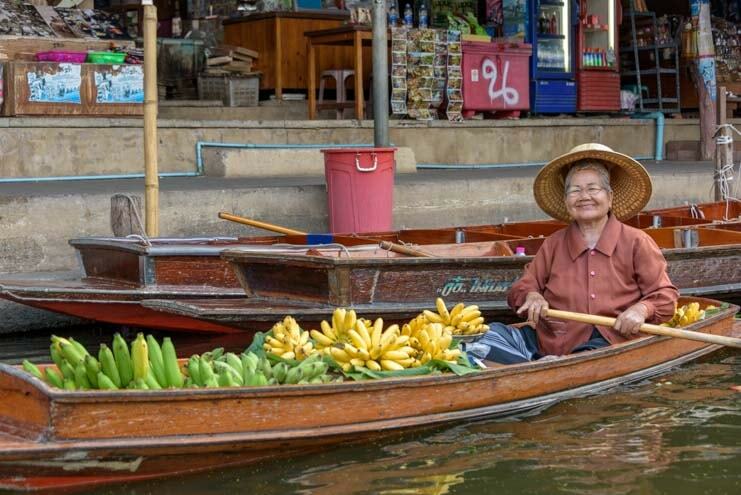 A floating market on the outskirts of Bangkok, Thailand, was a fascinating excursion. We took a train ride to Kanchanaburi and hiked in caves where shrines to Buddha adorned the entrances. 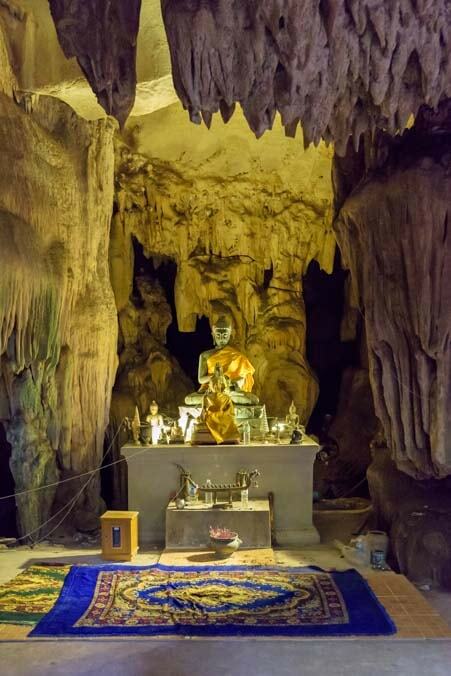 Shrines to Buddha — and to the recently deceased king — were everywhere, including in entrances to caves! And we saw young monks walking along the tracks of the Death Railway where we learned of the atrocities that took place during WWII along the River Kwai. 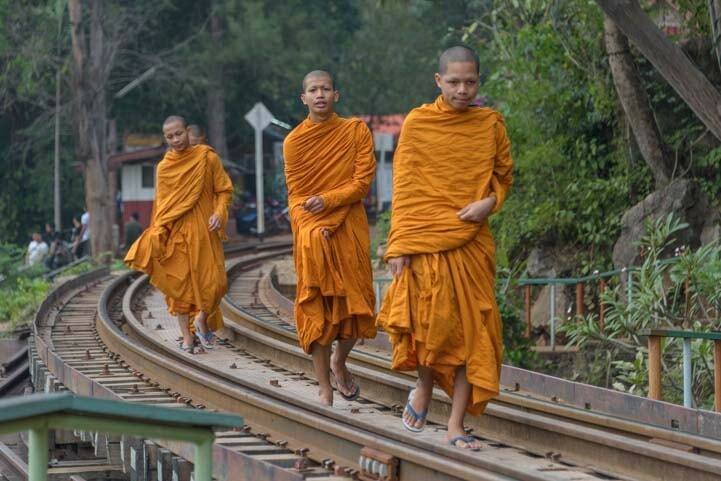 Monks walk the train tracks at the somber Death Railway. 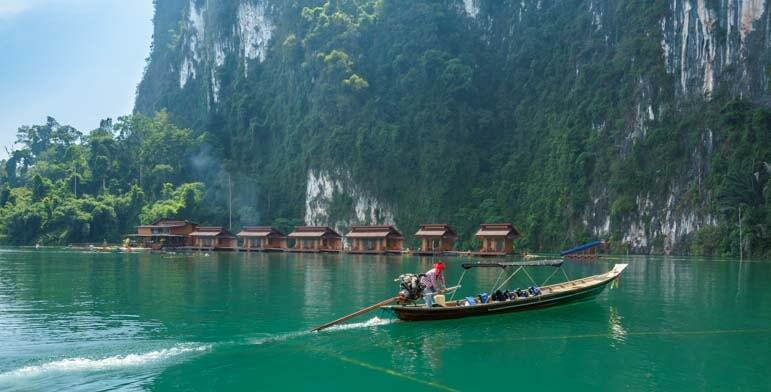 In the heart of Thailand at Cheow Lan Lake we stayed in a floating raft house at the base of towering limestone cliffs. The hosts took us on longtail boat tours around the lake in the early morning mist and after dark under the stars. One of many highlights was taking longtail boat rides and staying in a floating raft house on Cheow Lan Lake. 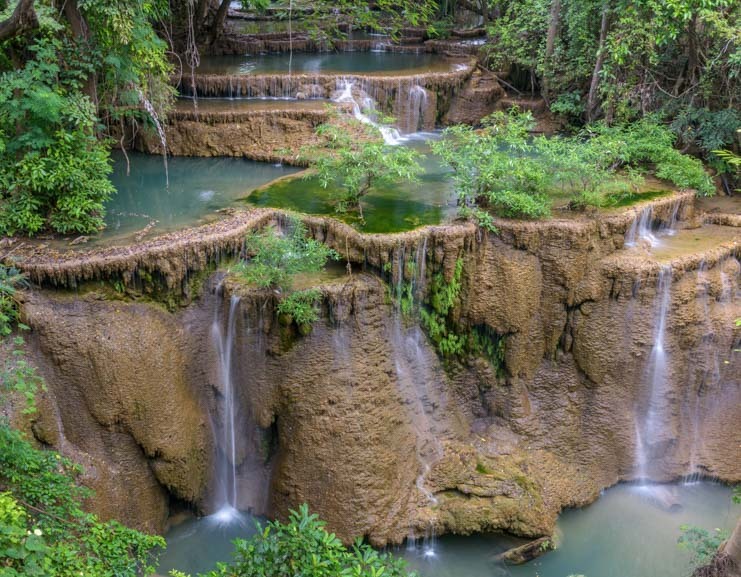 We also visited two stunning and very exotic waterfalls, one in Erawan National Park and another in Sri Nakarin Dam National Park. 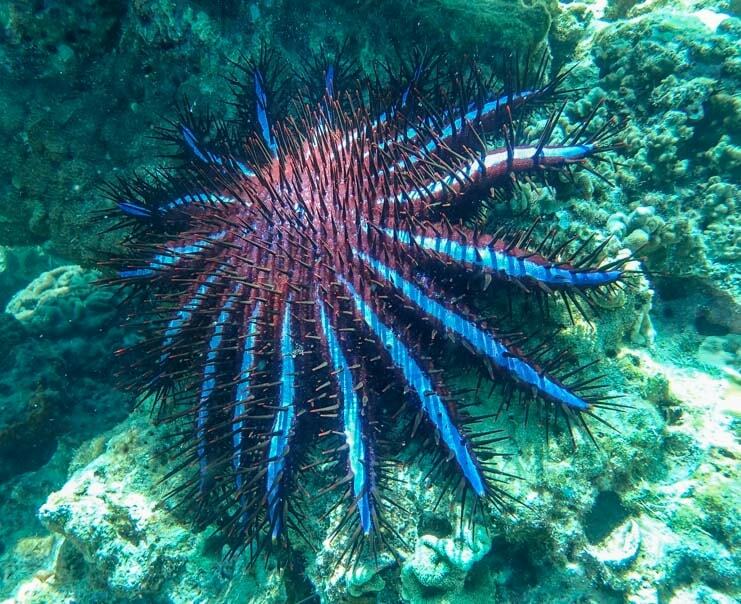 At the south end of Thailand we stayed on the beach in Ko Lanta and snorkeled reefs that were teeming with unusual and colorful sea life, from giant purple clams to huge prickly blue starfish to Nemo’s cousins living among the sea anenome. 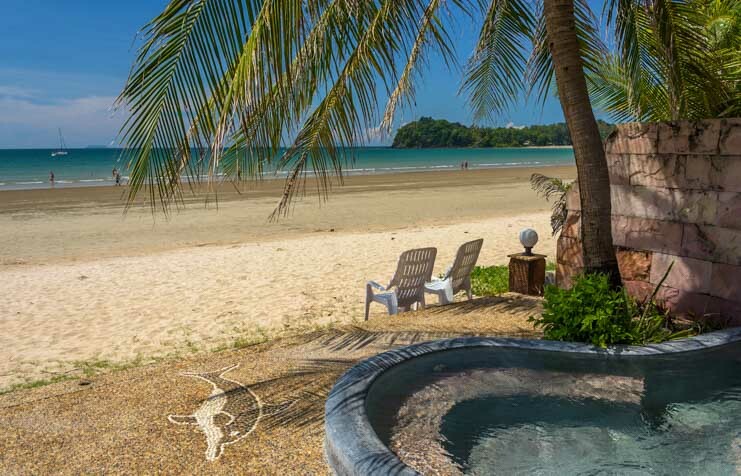 We relaxed on the beach on the Thai island of Ko Lanta. Snorkeling the reefs we saw giant purple clams, spiky blue starfish and we found both Nemo and Dora too. 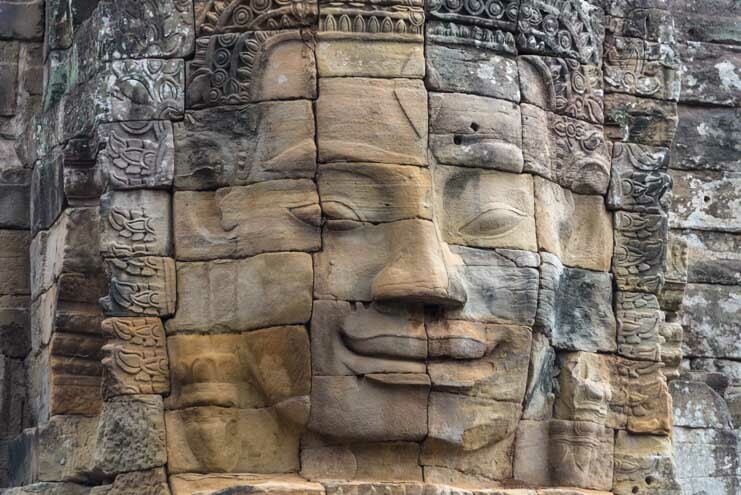 We decided to visit Thailand on the urging and invitation of one of our blog readers, and when we finally decided to fly halfway around the world to visit Southeast Asia, he wrote to us with great passion about the ancient Khmer ruins in Angkor Wat next to the town of Siem Reap in Cambodia. Are we ever glad that he took the time to write such a colorful description of the area and suggest we visit there too. Thank you, Dave! Cambodia touched our us deeply and has found a place in our hearts forever. 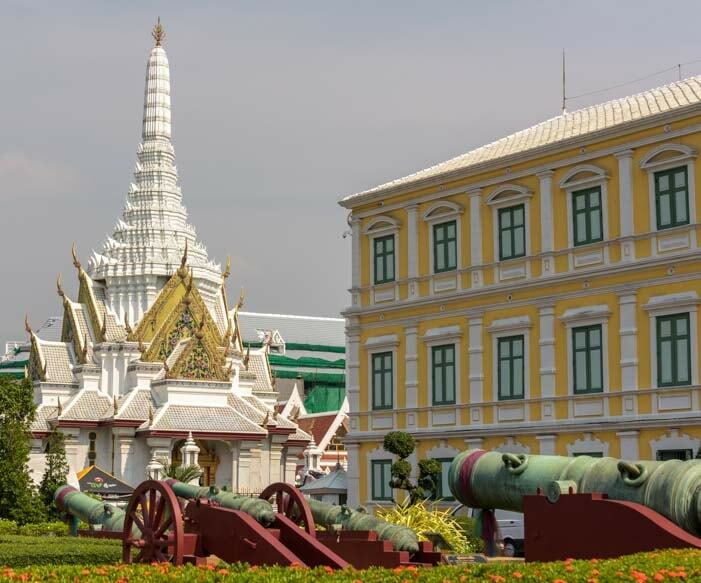 Whereas Thailand felt like an Asian version of Mexico — a Second World country coming into its own with lots of bustling and profitable industry and a fairly sophisticated tourist infrastructure — next door Cambodia was a world apart. We found that Thailand was very similar to Mexico in many ways, but Cambodia was unlike anything we had ever experienced before. There was an innocence and joy in everyone we met that surprised us. 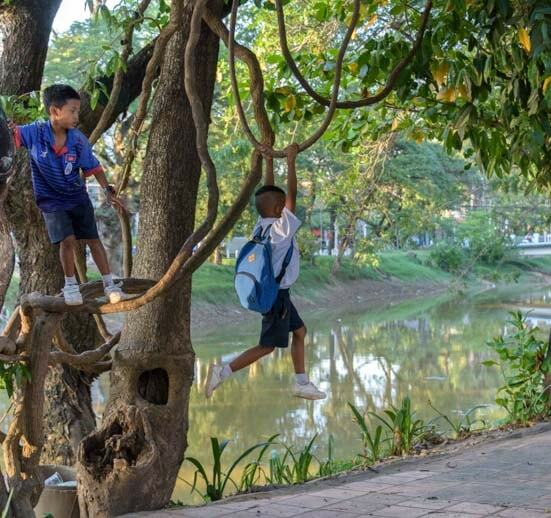 Cambodian schoolkids swing on the vines on their way home from school. 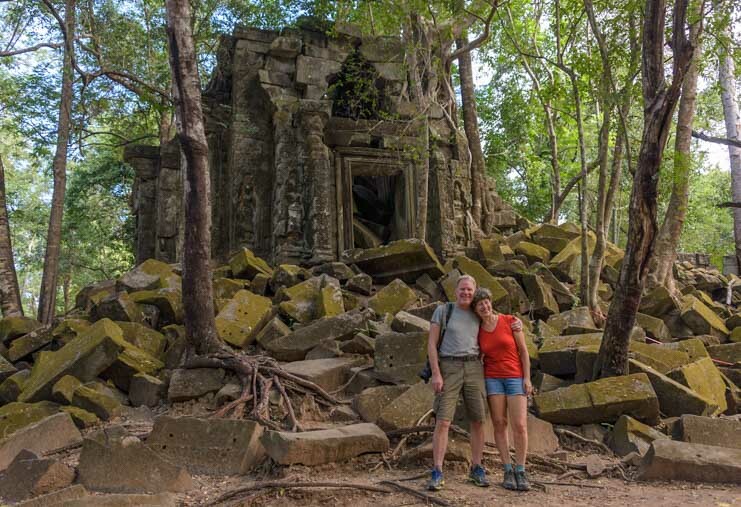 The many miles wide sprawl of endless ancient Khmer temple ruins around Angkor Wat were breathtaking, both for their mystery and because of their toppled condition. The stories we heard of the roles the ruins and their riches played in the conflicts during the latter quarter of the last century were mind boggling. 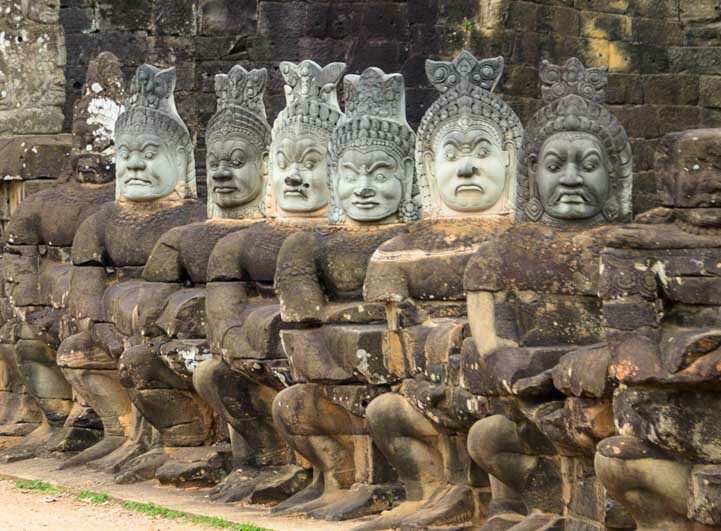 The ancient Khmer ruins hold the mysteries of an ancient and sophisticated world. We even found one temple ruin that was reminiscent of the Mayan step pyramids an ocean away in southern Mexico. The ruins dated from about the same time period too. 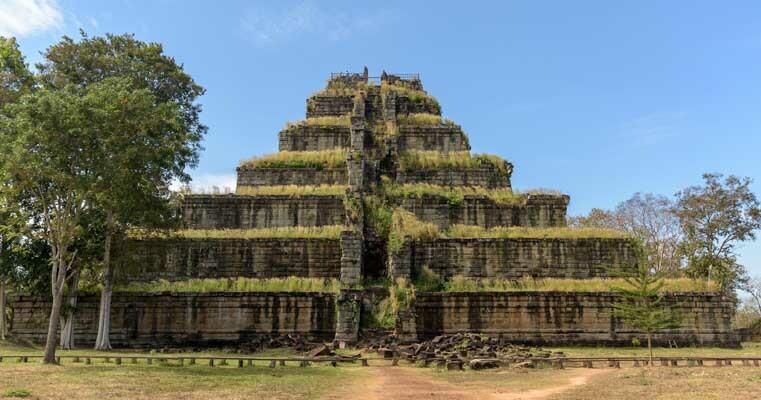 One ancient Khmer ruin is shaped like the step pyramids of Meso-America. We spent several days crawling all over these fascinating ruins, many of which are an hour’s drive from the central complex. This face is dozens of feet tall. Guards at the gate of an Angkor Wat temple palace. The jungle is a living being, though, and it has spread its roots across many of the temple ruins, often covering them up completely. 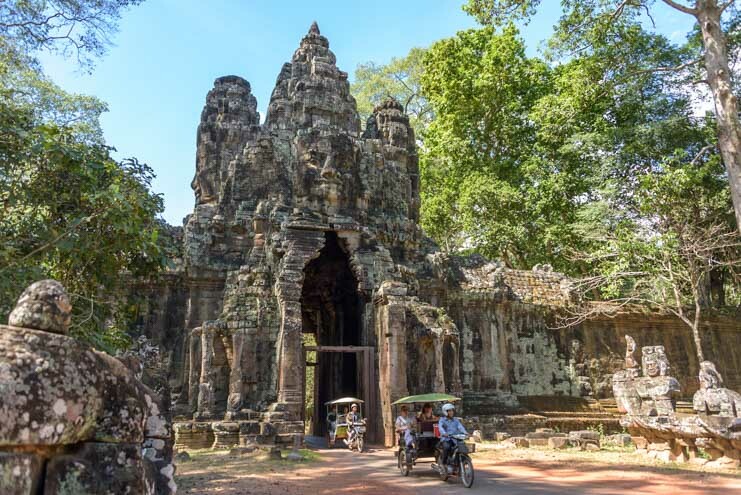 The jungle engulfs the ancient Khmer ruins! We had noticed that modern Cambodian writing and Thai writing are nothing like each other, but we were astonished when our Cambodian guide pointed out the many inscriptions carved on the arches and lintels of the Angkor Wat temple ruins and revealed that he couldn’t read them at all either! 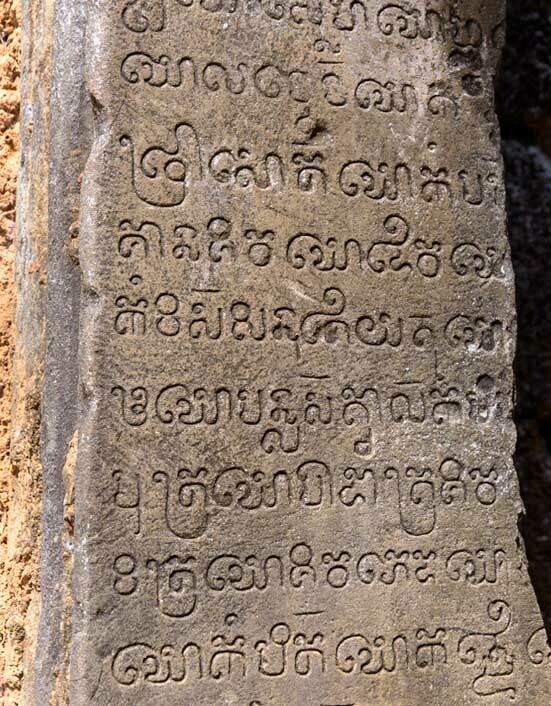 Ancient Khmer inscriptions carved into the temple door jams and lintels. The language has roots in Sanskrit. 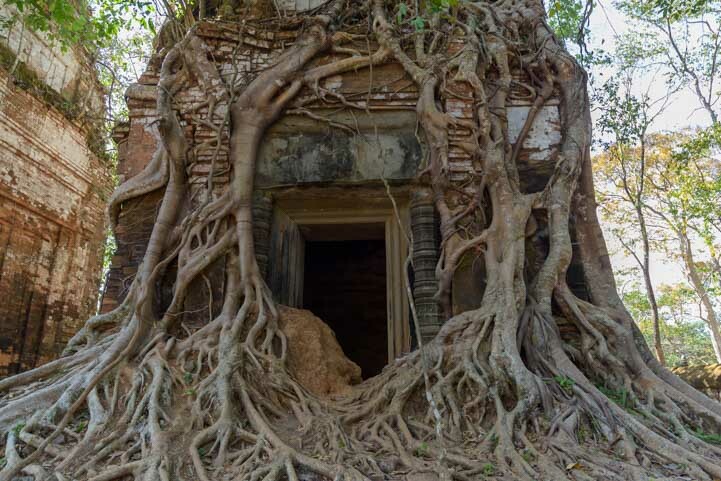 However, aside from the mysteries of the ancients, it was the tales we were told of recent Cambodian history that left us reeling. We didn’t know anything about Cambodia before we got there, and our jaws hung open as we heard horrifying stories first-hand from our guides and drivers about what they, their parents and their families had lived through during the same years that Mark and I had been young adults getting our lives started in a country where basic freedoms and extraordinary abundance are easily and often taken for granted. A day spent visiting a Cambodian family in their home left a moving and long lasting impression on both of us. 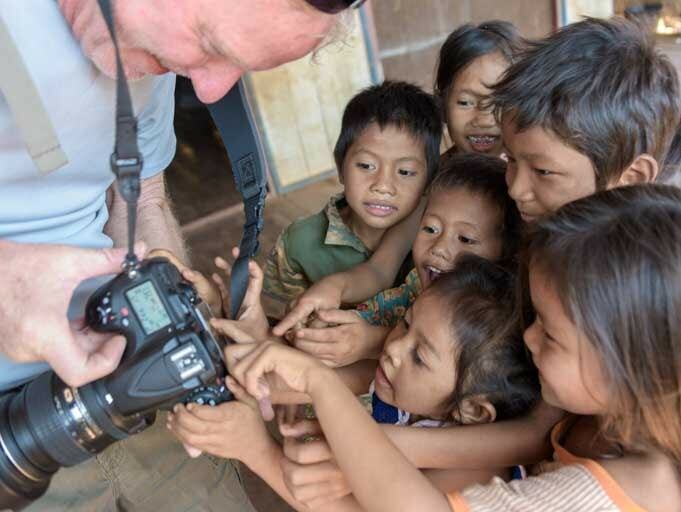 We enjoyed a priceless day trip to the home of a Cambodian family where the kids, cousins and friends got a kick out of hamming it up and photo-bombing each other for our cameras. 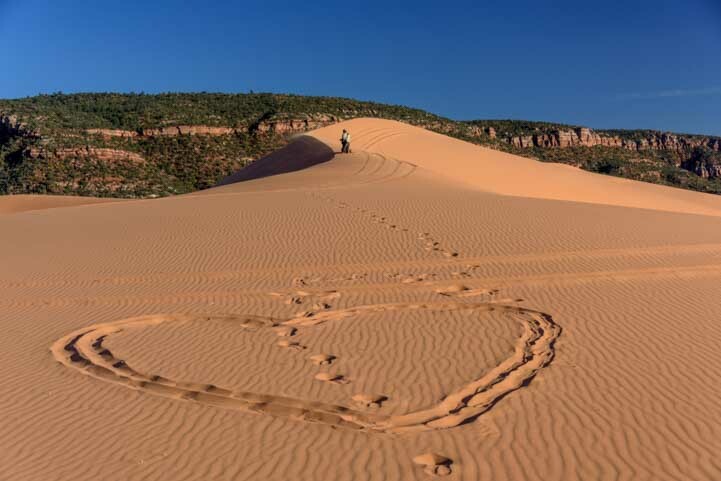 When we returned to America we stayed around Arizona for a while in our buggy, relaxing in the beautiful Sonoran desert along its waterways and camping amid the rock art petroglyphs of Gila Bend. 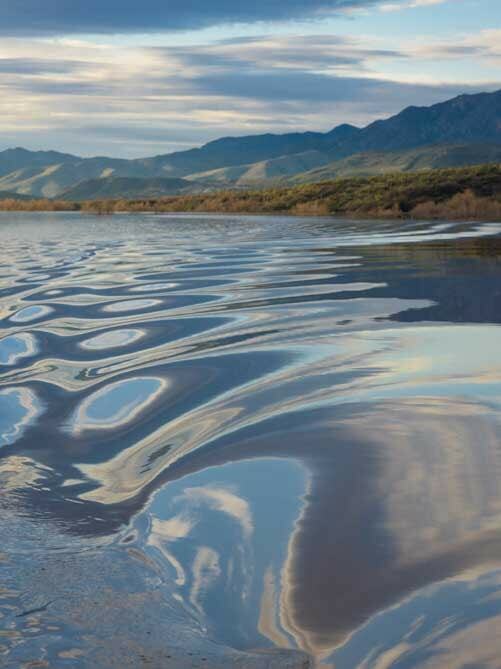 Water ripples in our wake in the Sonoran Desert. 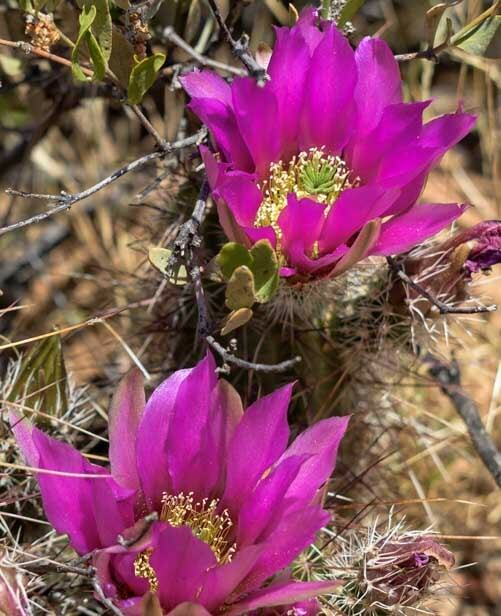 Blandly colored cactus have the most brilliantly colorful flowers each spring. When family members said they were going to Hawaii in a few weeks, we couldn’t pass up the special and very rare opportunity for a reunion with loved ones in the tropics, so we found ourselves at the airport once again! 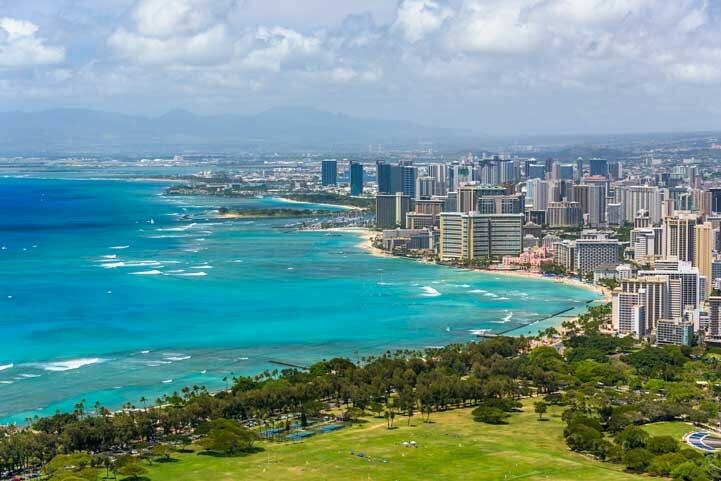 At the last second we parked our trailer and flew to Hawaii for a fabulous week with family in the tropics. Back in our trailer “for good” this time, we traveled through Winslow and Holbrook, Arizona, and got our kicks on Route 66. 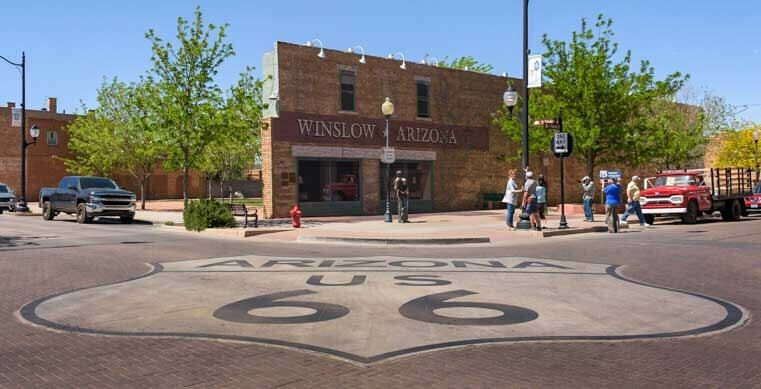 Winslow and Holbrook Arizona are highlights on Route 66. 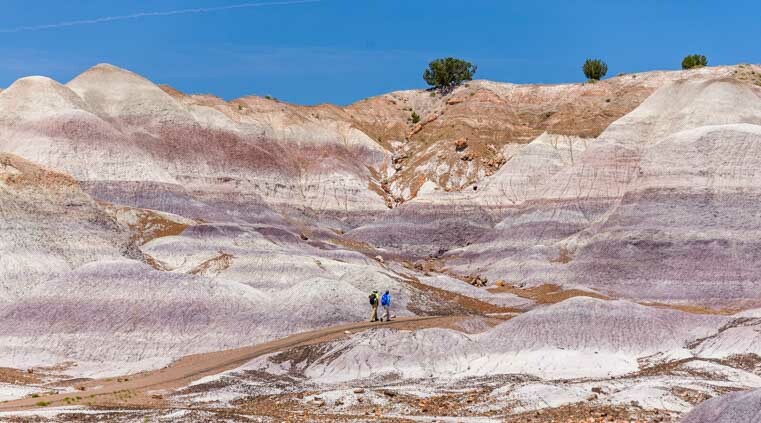 We did a few hikes in Petrified Forest National Park, scrambling around the magical Jasper Forest and hiking between the vivid white and lavender striped mounds of Blue Mesa Trail. 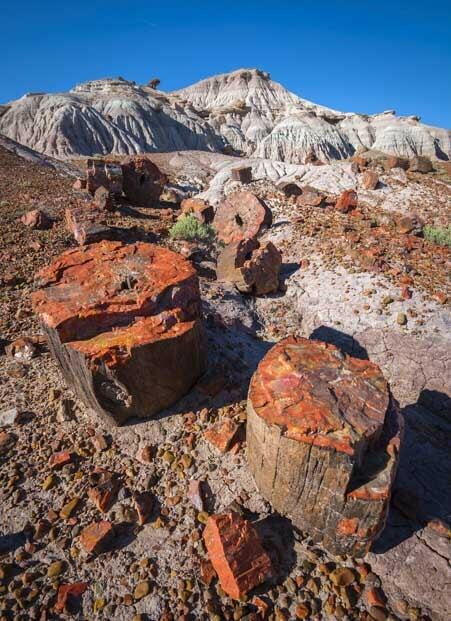 Stone “logs” at the magical Jasper Forest at Petrified Forest National Park in Arizona. Blue Mesa Trail at Petrified Forest National Park in Arizona. At Canyon de Chelly National Monument in Arizona we peered over the edges of the sheer walls to the green valley below and watched a brilliant sunset erupt over Spider Rock. 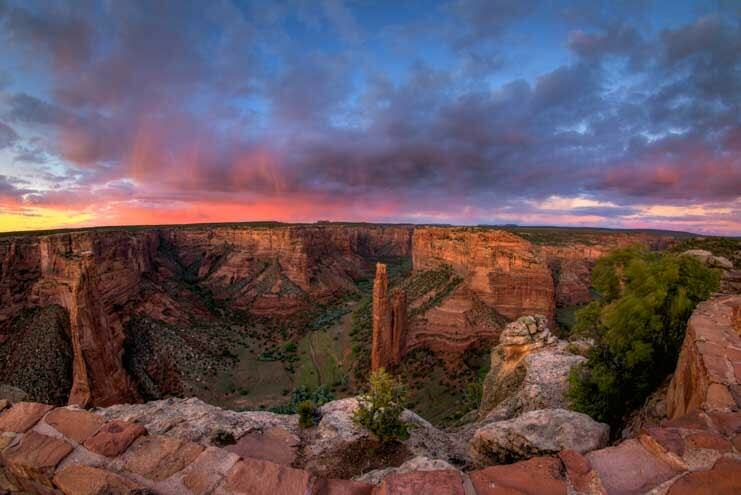 Spider Rock at sunset in Canyon de Chelly National Monument, Arizona. Continuing east and north, we stopped by Bisti Badlands in New Mexico where another glorious sunset showed off the famous alien eggs at our feet. 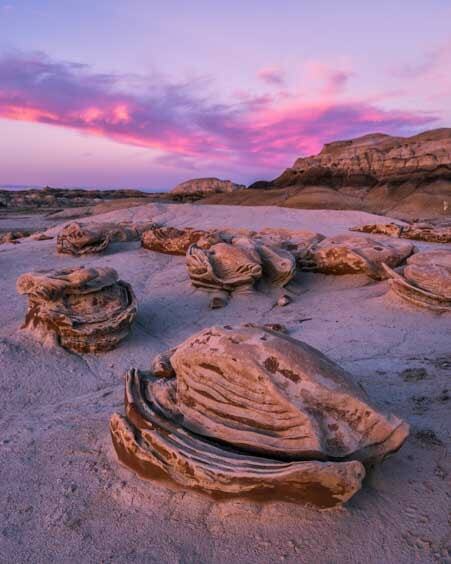 Pink skies above the alien eggs at Bisti Badlands, New Mexico. We were now in Indian pueblo country and we explored both the Aztec National Monument ruins, which are a massive ancient collection of adjoining rooms, and the ruins at Bandelier National Monument, an ancient cliff dwelling community built into natural rock holes. 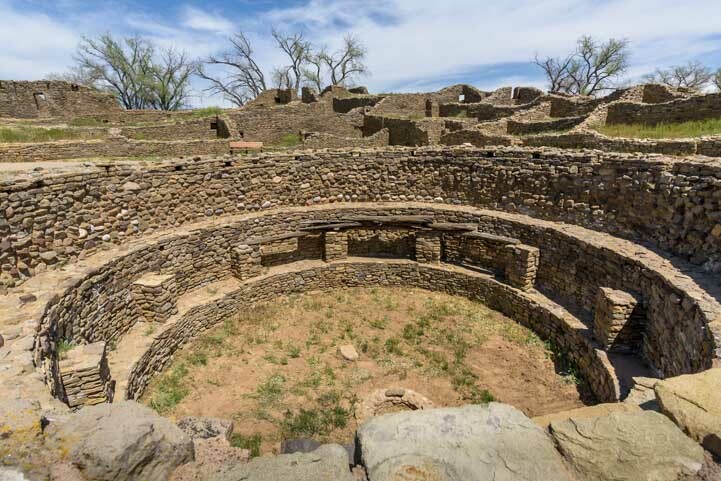 The Kiva at the ancient Indian ruins of Aztec National Monument in New Mexico. 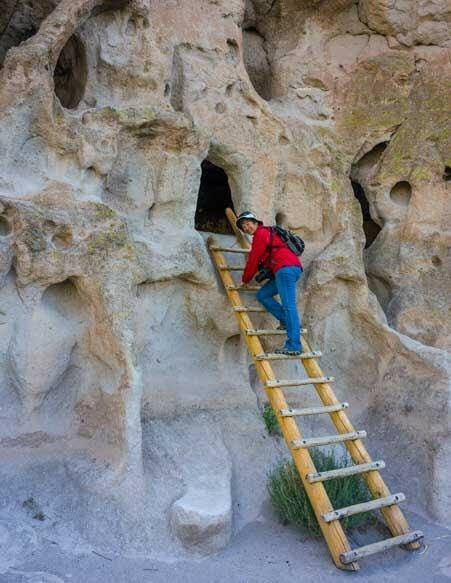 Bandelier National Monument in New Mexico has wonderful ladders for visitors to climb up and see the cliff dwellings. 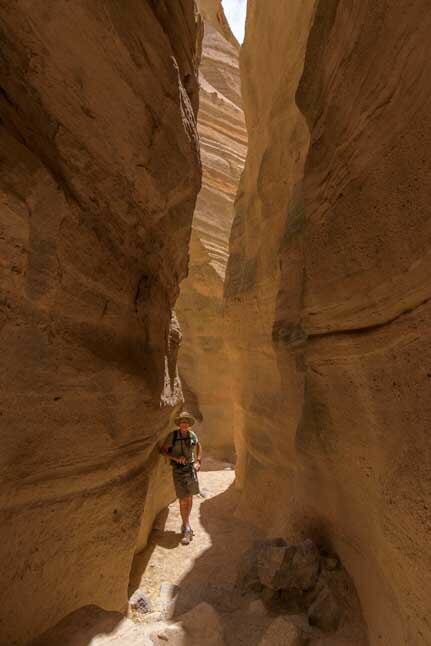 Visiting nearby Tent Rocks National Monument in New Mexico, we hiked through a slot canyon and then up a steep climb to the sky where rock formations are lined up like a series of tents. Tent Rocks National Monument in New Mexico — the slot canyon. 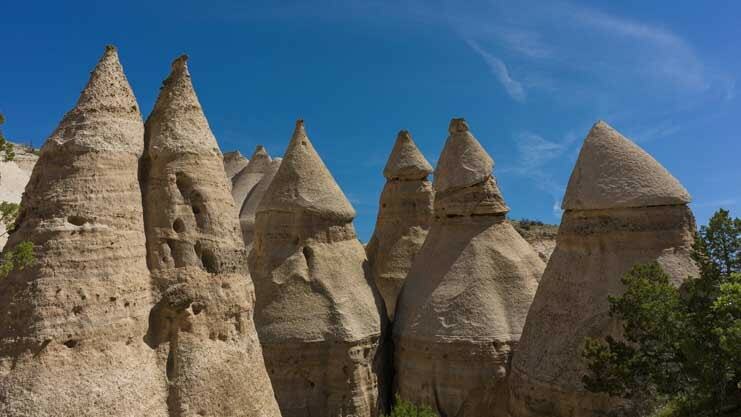 Tent Rocks National Monument in New Mexico — the tents. The new Valles Caldera National Preserve in New Mexico had recently opened to visitors, and while we were camped nearby we found ourselves in a spring blizzard. But we descended from the 10,000′ altitude to find warmth again outside Great Sand Dunes National Park. 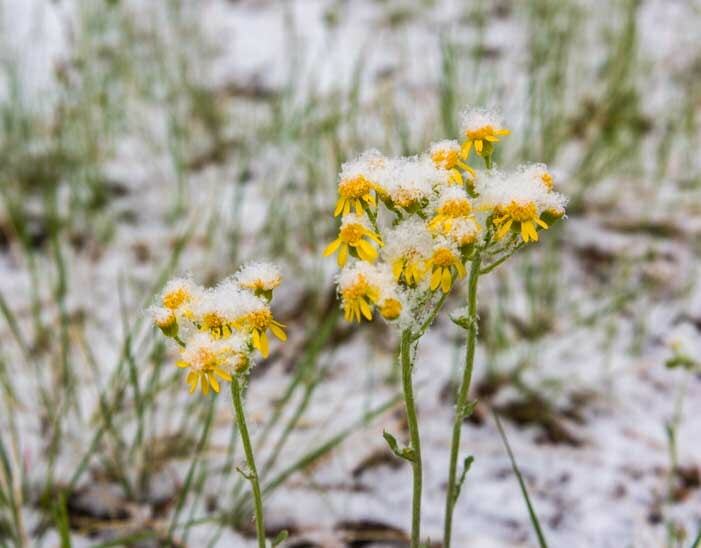 Snow on spring flowers near Los Alamos, New Mexico. 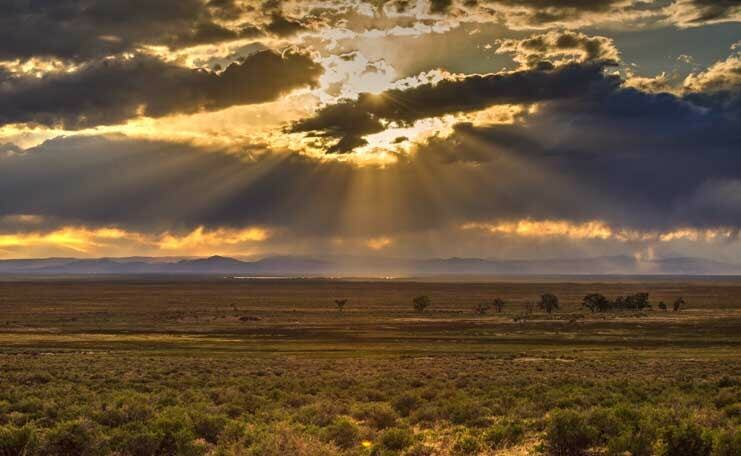 The heavens open up near Great Sand Dunes National Park in Colorado. The end of May marked our 10th year of traveling full-time, and in celebration we published two posts giving an overview of all we’ve seen and done: Part 1 and Part 2. What an unbelievable decade it has been! 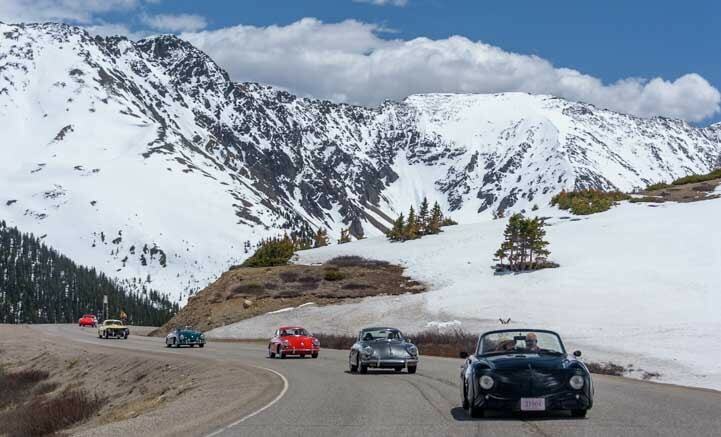 We found plenty of snow when we climbed back up into Colorado’s Rocky Mountains, however, and we joined our friends on a Porsche 356 rally where we tucked ourselves into the backs of cute bathtub Porshe roadster convertibles and took photos of the beautiful snowy peaks! 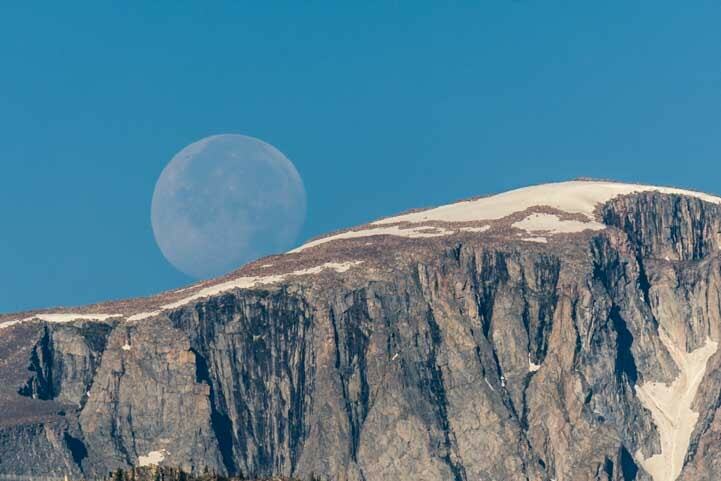 What a way to see the Colorado Rocky Mountains — in a Porsche roadster rally! We made our way to the Black Hills of South Dakota where we explored the beautiful town of Custer and nearby Custer State Park. 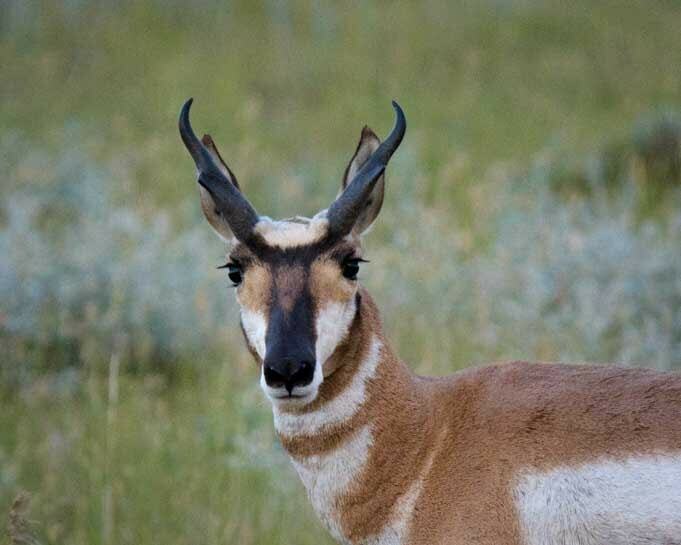 The Wildlife Loop Road in Custer State Park is home to all kinds of critters, and we saw prairie dogs, pronghorn antelope and buffalo at close range. 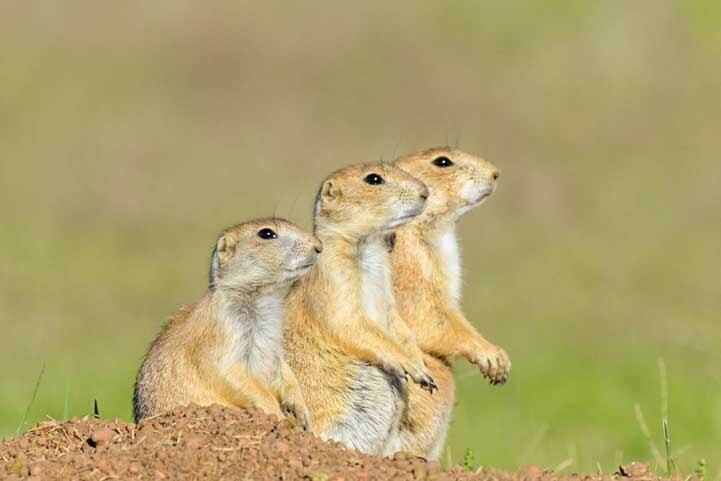 Custer State Park has several big prairie dog communities. 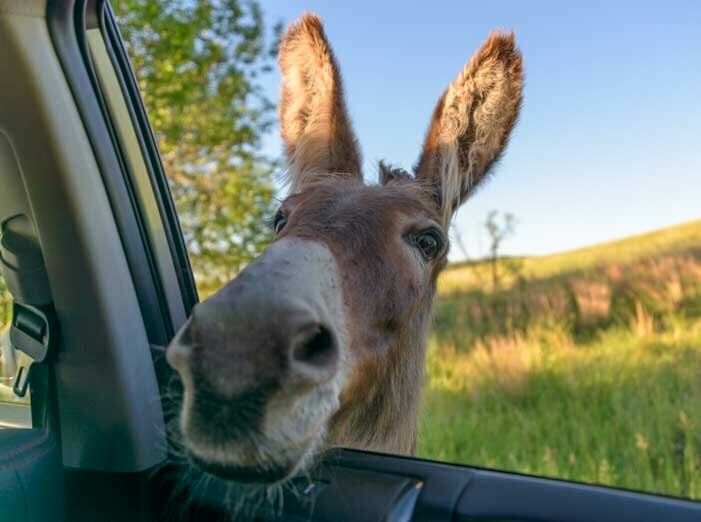 A herd of wild burros entertains visitors at Custer State Park, and they have been fed by tourists for so many years and have become so tame that they now think nothing of poking their heads inside the car window to see what kinds of snacks you brought for them! A wild burro peers in a car window at Custer State Park in South Dakota. Some of the wild burros had adorable babies. This one leaned against me and almost fell asleep! 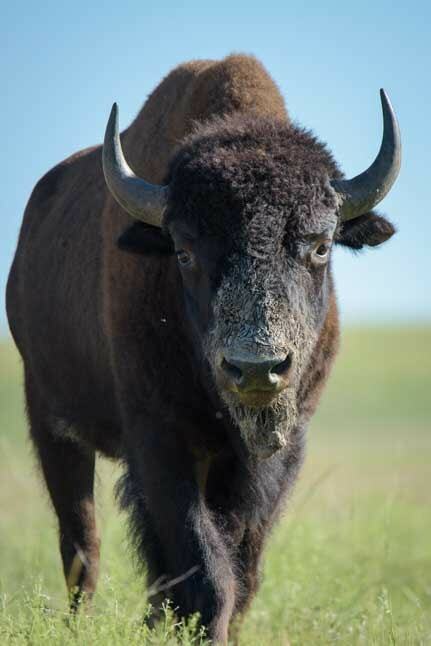 We had ventured to South Dakota’s Custer State Park to meet up with professional wildlife photographer Steve Perry, and our cameras clicked animal images non-stop for a few days. A buffalo walks towards us. 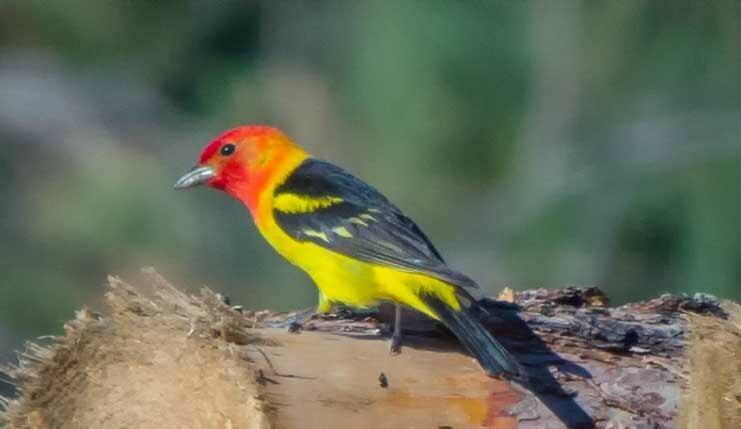 A western tanager in the Black Hills of South Dakota. 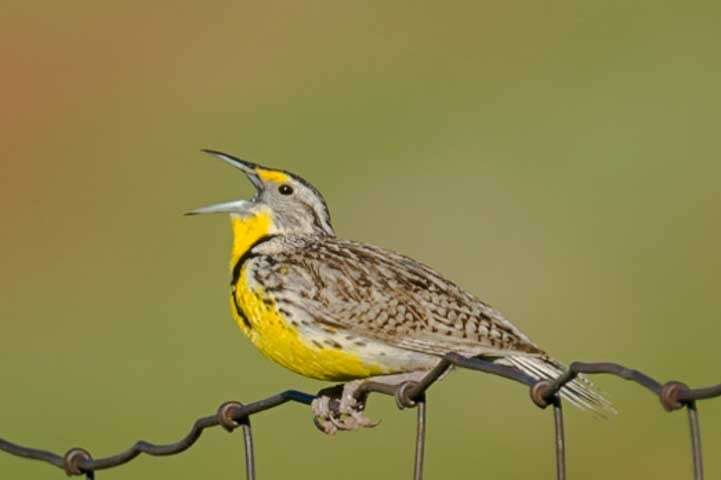 A meadowlarks sings his heart out. 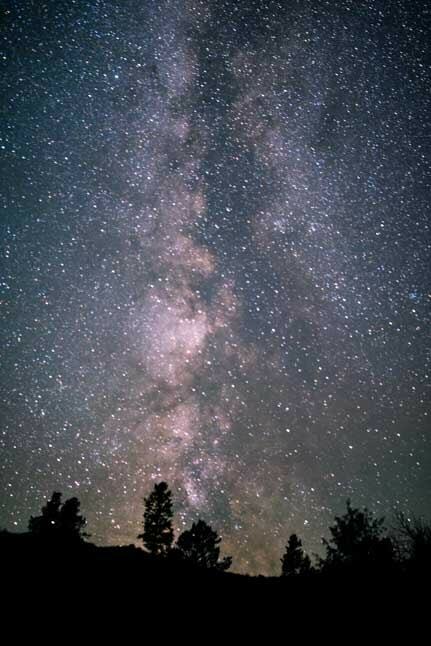 This part of the world is distant enough from big cities that the Milky Way is easily visible, and we enjoyed some night photography in Custer, South Dakota, too. 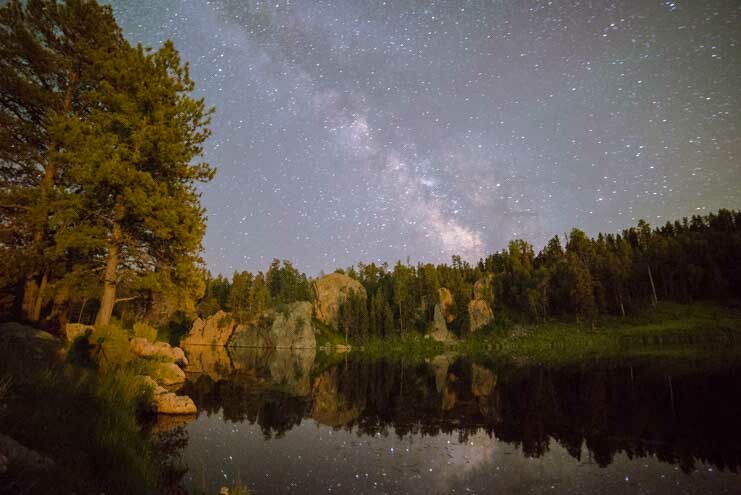 The Milky Way reflects in still water near Custer, South Dakota. Custer, South Dakota, was also an ideal place to enjoy an old fashioned small town 4th of July celebration, complete with a parade and fireworks. 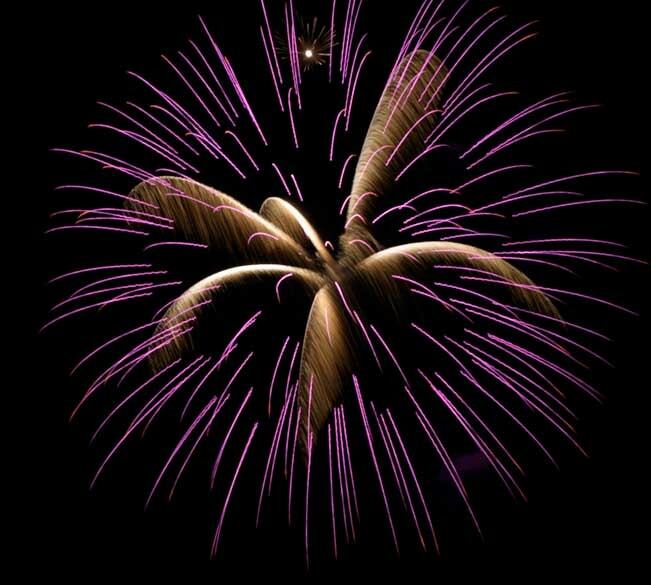 Fireworks were a highlight of the small town 4th of July celebration in Custer, South Dakota. 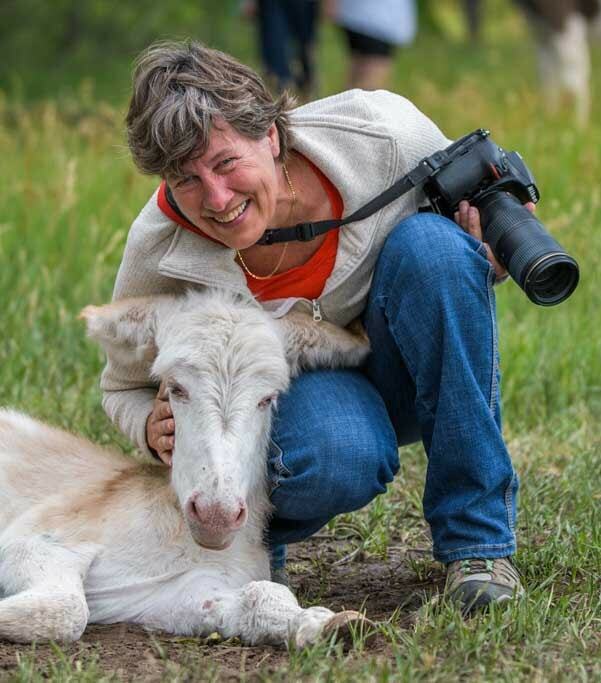 We then made our way to Buffalo, Wyoming, and the Big Horn Mountains where we bumped into two weekend-long celebrations, the first one honoring the Longmire TV series and the second one honoring the Basque sheepherding heritage of many of the families in the area. Buffalo, Wyoming, is a wonderful small town near the Big Horn Mountains. 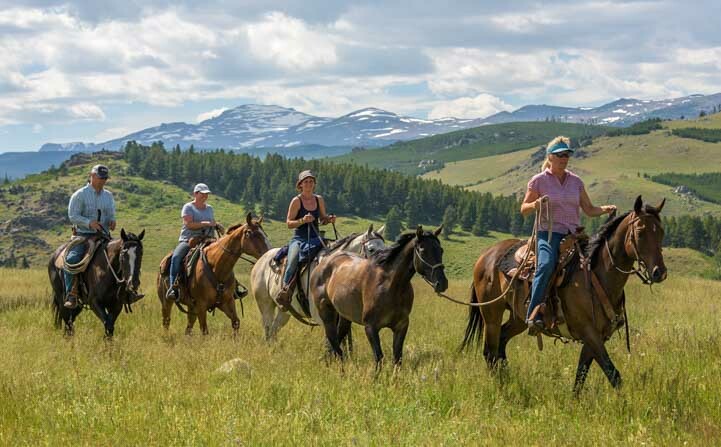 Horseback riders enjoy a trail ride in Wyoming’s BIg Horn mountains. 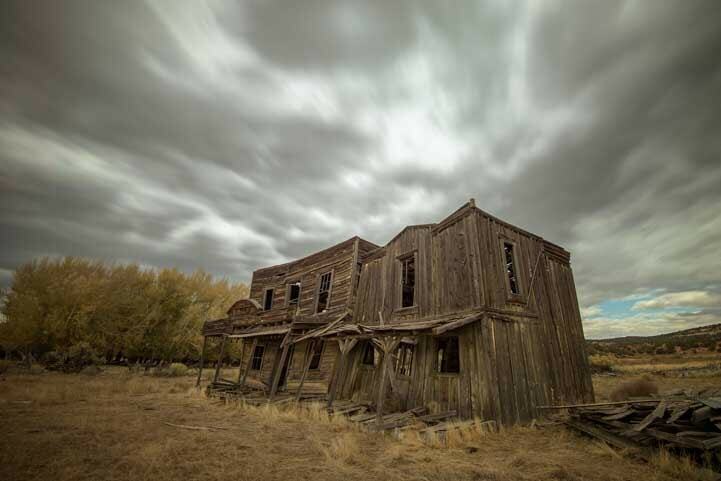 Although we had visited the western side of Wyoming (home of Grand Teton and Yellowstone National Parks) several times in the past, this was our first trip to the eastern half of the state, and we loved the quiet towns and less touristy feeling of the area. 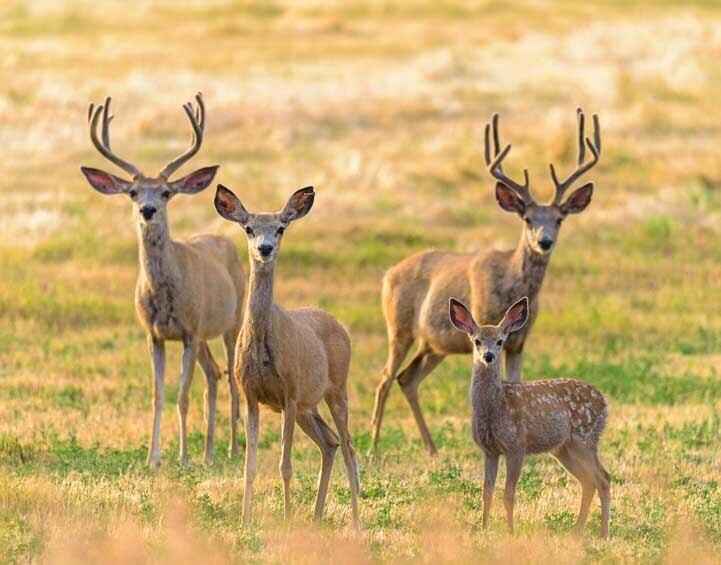 Spotting a deer is always special, but having a group stop and stare at us was truly fabulous! The dark night skies drew us outside in the wee hours of the morning for more shots of the Milky Way. 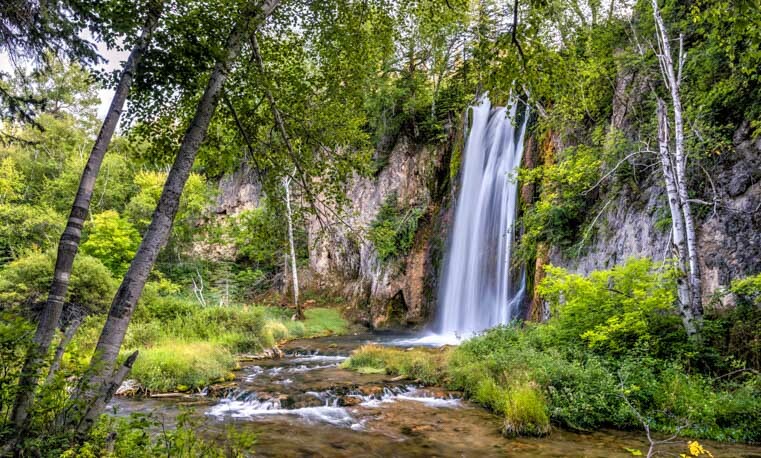 Looping back through South Dakota’s Black Hills, we stopped in at the famous Sturgis Bike Week motorcycle rally and explored Spearfish Canyon and its lovely waterfall. The Sturgis Bike Week motorcycle rally is an over-the-top testosterone fest that was a blast to see. After a pit stop at Wall Drug, South Dakota, the once unknown small town drug store that now boasts billboard advertising worldwide, we visited Badlands National Park where we saw lots of big horn sheep. We were very close to the path of the total solar eclipse that crossed the country in August, and we got a kick out of doing time-lapse videos as the sky darkened and lightened again. The funny Wall Drug billboards can now be found far from Wall, South Dakota, and the coffee really is 5 cents! 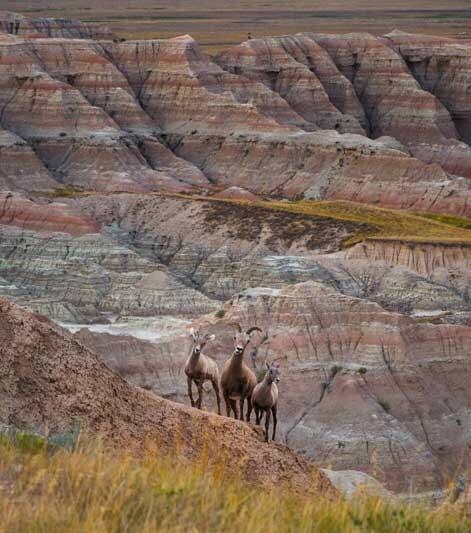 Big horn sheep in Badlands National Park, South Dakota. 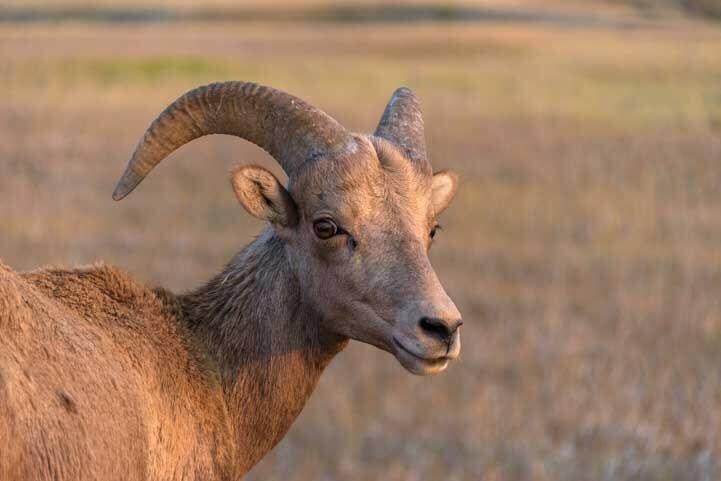 A big horn sheep at sunset. 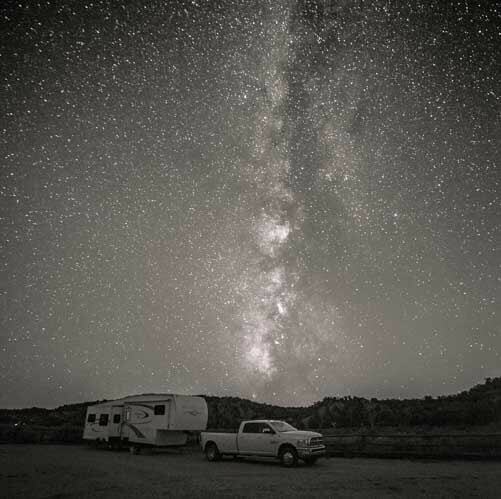 Making a beeline westward, we took a brief time-out to climb up on the Continental Divide in Colorado and then settled into Las Vegas, Nevada, where we saw the most amazing nighttime light show when Mother Nature filled the sky with lightning bolts. 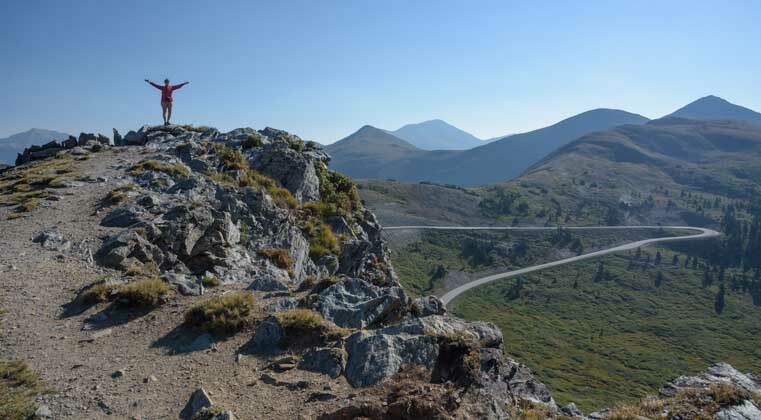 Hiking the Continental Divide in Colorado. 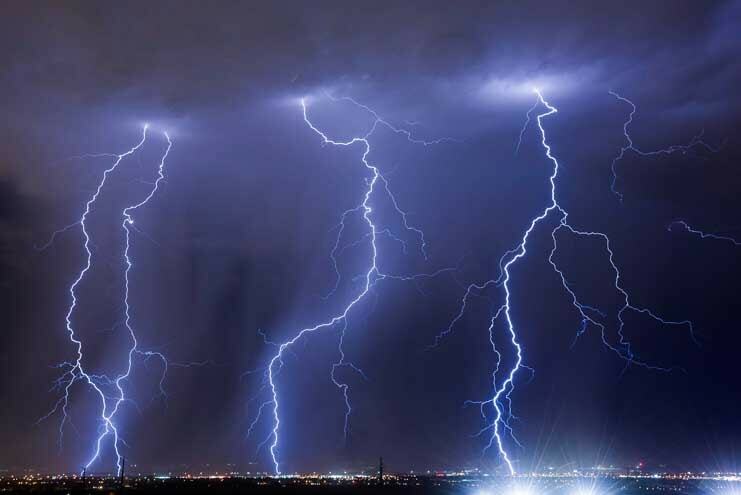 Las Vegas is known for big shows, and Mother Nature’s lightning show during our stay was just stunning. 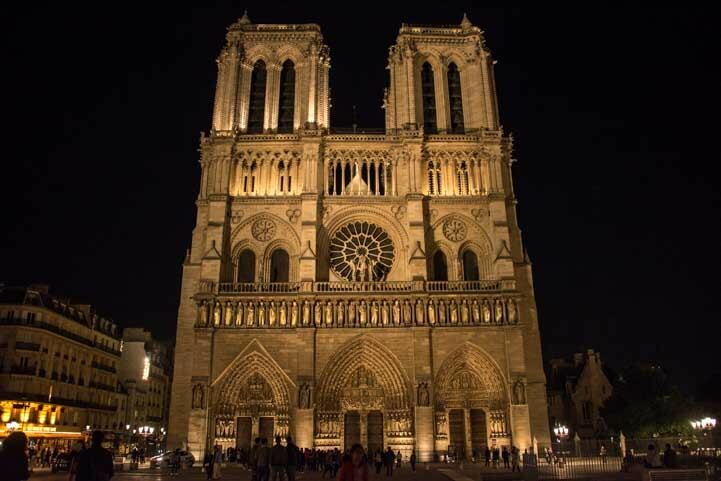 While Mark attended the Interbike bicycle trade show in Las Vegas, I hopped on a plane to visit my mother in Paris. 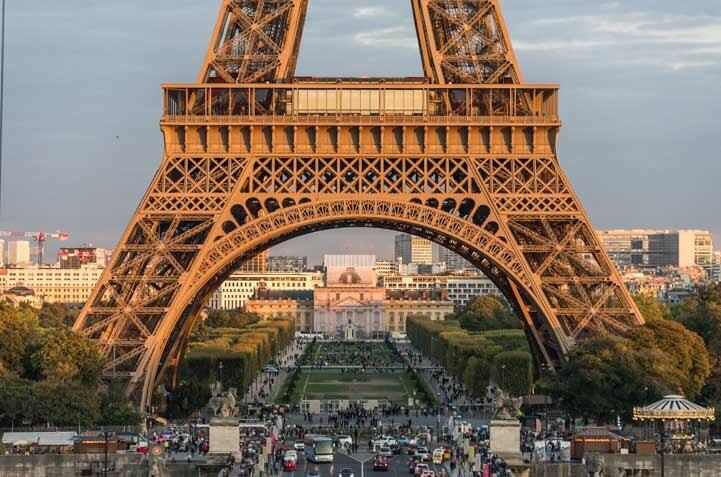 From the Eiffel Tower to Notre Dame to ballet and opera performances galore, she took me on a memorable tour of the City of Light. 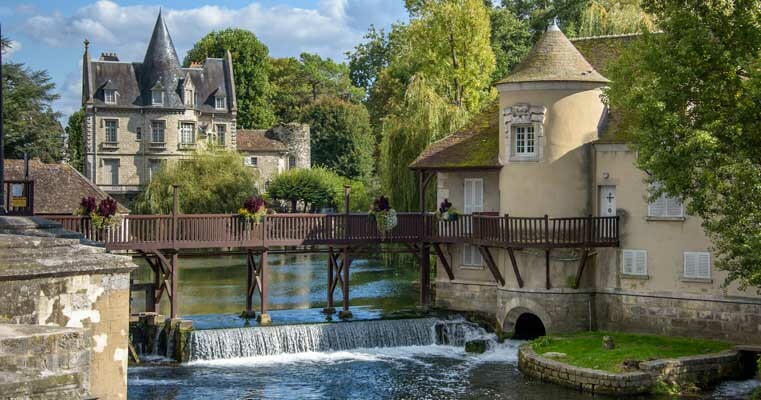 We took a quick train ride beyond the Paris city limits to spend a day exploring the medieval town of Moret sur Loing. The charming architecture resembled a fairy tale, and I was astonished to read a tourist sign outlining the town’s history and see the first date on the sign was from the year 1045! Fairytale medieval buildings in the village of Moret-sur-Loing just outside of Paris, France. 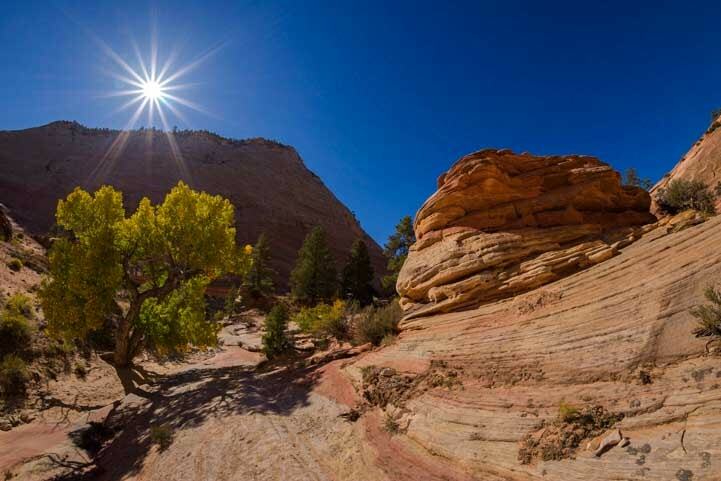 Back in our buggy in the southwest, we resumed our travels with excursions around the town of Kanab, Utah, first on the scenic road leading to Zion National Park and then to Coral Pink Sand Dunes State Park. Zion National Park Utah scenery along the road into the Park…! 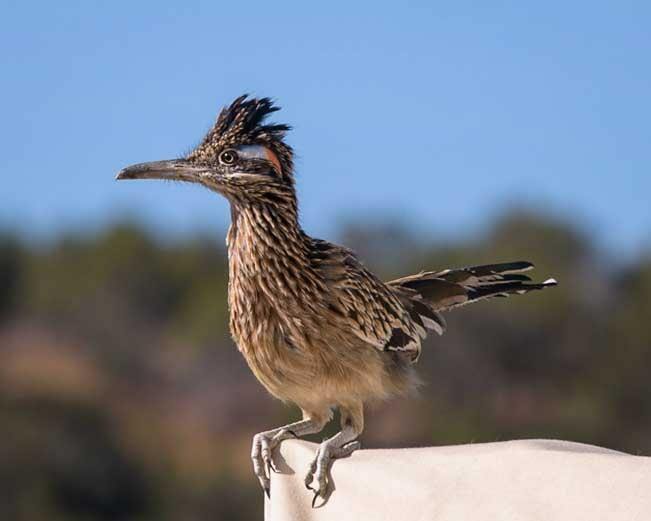 We were blessed with another fabulous wildlife sighting when a roadrunner posed for us within just a few feet, and we had a fun a nighttime adventure in an old movie set where the ghosts and goblins roamed free at Halloween. A roadrunner let us take lots of close-up shots in Utah. Johnson Canyon movie set near Kanab, Utah. 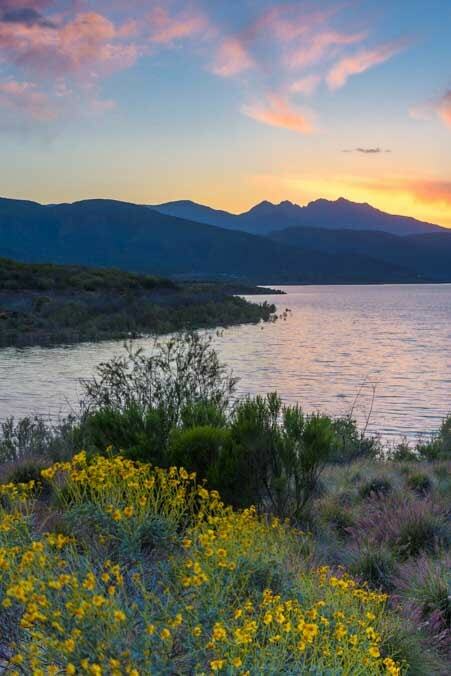 Just a short distance west of there, Sand Hollow State Park gave us a beautiful waterfront adventure as we camped on the beach enjoying mountain views and glorious sunrises and moonrises. 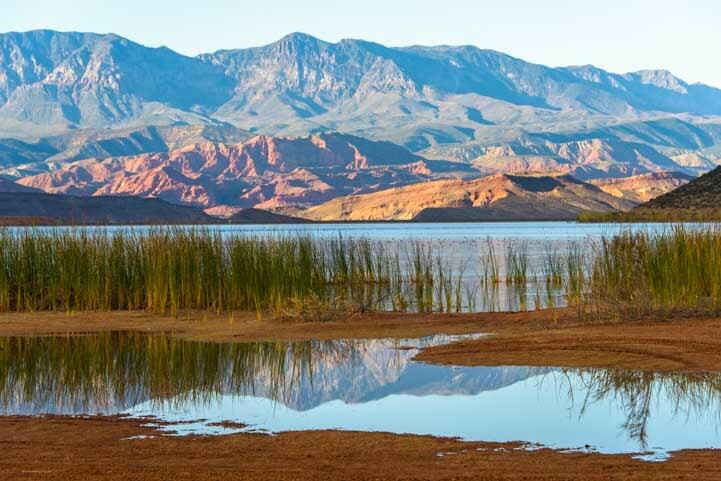 Sand Hollow State Park reservoir and mountain views. A full moon rises at Sand Hollow in Utah. A side-by-side rally capped off our stay in the orange sand dunes, and then we took a spectacular scenic drive down the west side of Lake Mead in Nevada. We tried out lots of side-by-side buggies at a rally. 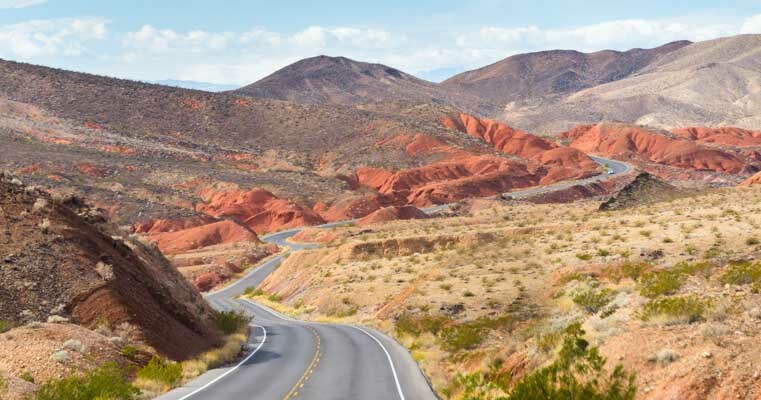 A little traveled road west of Lake Mead offered some wonderful scenery. Back in Arizona we found ourselves by water once again as we hiked along the Salt River, one of Arizona’s waterways that brings moisture and life to the Sonoran Desert. We attended a “ranch sorting” cowboy and horsemanship competition in Phoenix to cap off our year of travel adventures during the Christmas week. 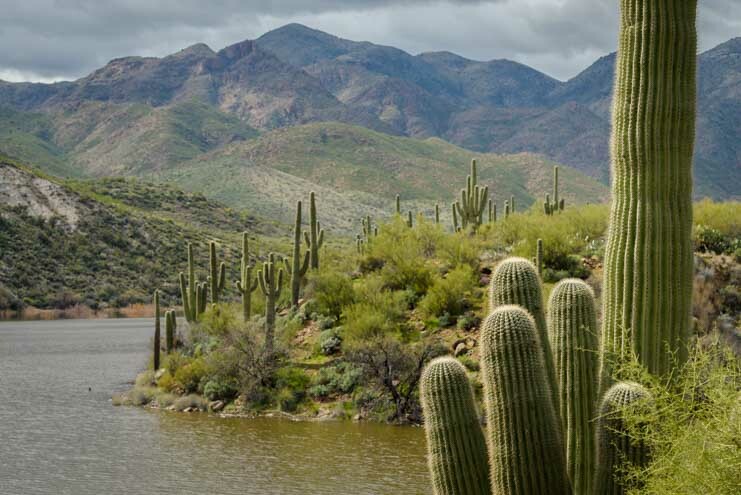 Central Arizona’s Sonoran Desert boasts many lovely waterways. 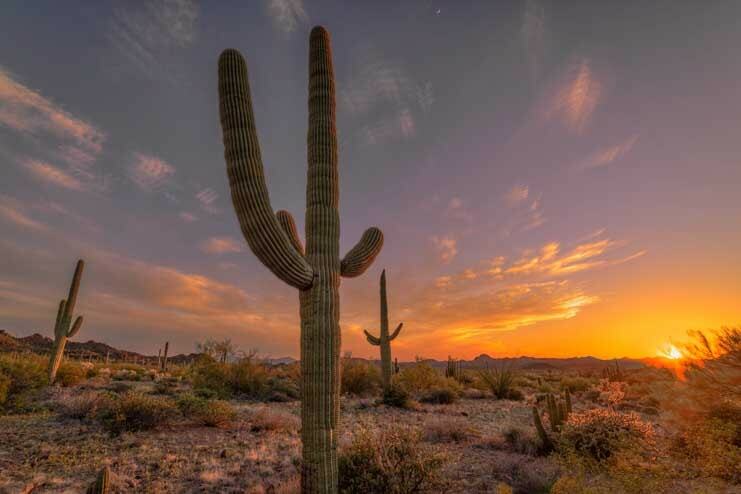 Arizona’s iconic saguaro cactus at sunset. 2017 was an incredible year that brought us endless beautiful photo ops and lots of new and precious life experiences. Here’s hoping for lots more exciting adventures in 2018!! Goodbye 2017 — Thanks for the great memories!! Happy New Year and Happy Travels to all!! This entry was posted in The Full-time RVing & Cruising Lifestyles and tagged Annual Travel Summary, New, Travel, USA, WP Travel by Roads Less Traveled. Bookmark the permalink. Beautiful suite of pics, Em. Thanks for sharing all your travels and experiences throughout the year. Thank you, Bob!!! We are so fortunate to be living this lifestyle in the era of the Internet where we can share the beauty of the world we see so easily. Happy 2018! LOL… 2018, the year of the dog? Stunning! Simply, stunning photos! Plus, all of the information you share with your readers for free is priceless (well, almost! lol). I hope we cross paths somewhere down the road, as meeting you two someday is high on my bucket list. Well, thank you, David. That’s quite a compliment — much appreciated! I hope we cross paths someday too. In the meantime, have fun on your travels and on your bike too!! Really enjoyed the highlights. Seeing some of those shots again made me add more areas to our “Places to Go and See” folder! As always, enjoyed every word and picture of it! Happy New Year! Thank you so much, Janet. It was quite a rush to go through all our photos and see what a spectacular year it was. We always marvel at how many wonderful places there are to visit, and despite all our travels, our “Places to Go and See” folder seems to get bigger every year!! Happy 2018! This post was a welcome reminder of warmer times! Thank you, again! I’m always happy to send some warmth to chilly New England in the winter months, Pete. (BTW it’s 77 degrees in the AZ desert right now… 🙂 ). HOW did you do/see ALL THAT ?????? Absolutely mind-boggling ! Congratulations on the review…and on more to come in 2018 !!!! It is a wonderful and very full life!!! And that’s how I always respond to YOUR emails as you describe your incredible adventures in France!! Wow! Let’s see you top that in 2018. I can wait to see what comes next! My wife and I are heading to the big camper show in Tampa next week. The search is on. Soon! Thanks, Jeff! 2018 is sure to be a great year all around. 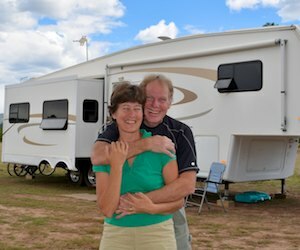 Have a blast at the Tampa RV show!! I have been re-reading your October article about “Full-Time Fivers” in Trailer Life. I have to thank you both again for the wealth of information available to your subscribers in this blog. In Tampa we will be able to compare so many different full-time units and your article will help prepare us. I have enjoyed learning about the truck, the hitch, the importance of the warranty, and…and…and…and…I could go on and on. So let me say very sincerely, once again, thank you for sharing with us! You are so very welcome, Jeff. Thank YOU for your many enthusiastic and encouraging comments. I try to write the things I would have loved to read back when we were planning and first starting out, and it is really heartwarming to know that my efforts are helpful and appreciated. Have fun at the Tampa show. The DRVs are beautiful and definitely can be found at affordable prices used, but be sure to check out the Space Craft trailer too. That will give you an idea of what top quality looks like! When you shop the used market, look at Hitchhiker, Excel, Travel Supreme and Newmar. Good luck!